This Battle Report will feature Elves of Light and Reptilians, commanded by fantastic gentlemen laribold under 7.0 version of the rules and army lists. Lizardmen under 8th edition were always a tough opponent for my Elves. Very resilient and hard hitting army with very nasty shooters and powerful magic. Hence, I was very curious to see what kind of spawning is going to emerge from 9th Age. Mr. laribold came up with a combined arms force, which to me is a staple of a classic Reptilian army should look like. Tough cohorts of cold blooded warriors, supported by fearsome monsters and quick but deadly skinks and led to battle by their High Priest and his trusty lieutenants. 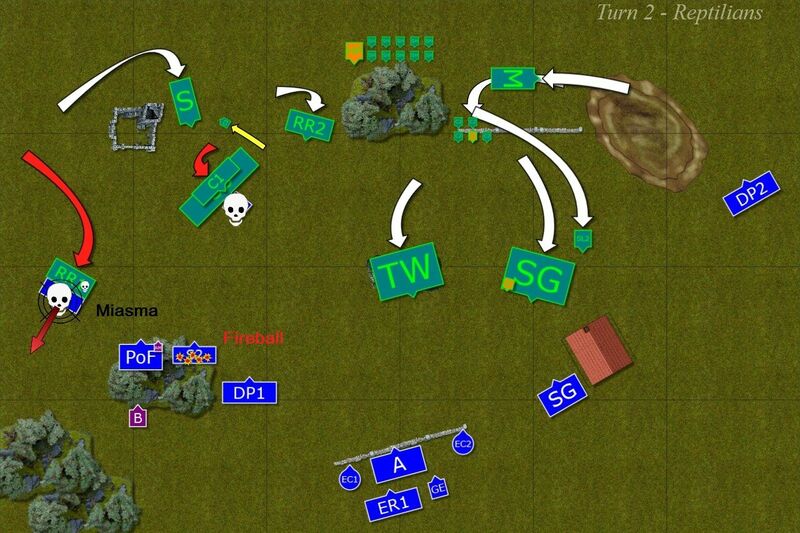 Very flexible army that participates in all phases of the game! It was clear to me that I had no units to fight Saurus infantry one-on-one so I had to either charge them with many of my troops or divert them and don't allow them to fight me. At the same time I knew I had to use my own shooting and magic to quickly get rid of chameleons and spike lizards as these shooters can interfere with any of my movement. In addition, I wanted to try and minimize the effect of Magic Beacons, i.e. things that allow High Priest to cast damage spells from comfortable distance. In order to do that my next priority would be Spinosaurus. I decided to go with weighted flank formation and managed to deploy in a way that gave me +3 bonus to first turn roll off. If I could win on my strong flank and use the center to distract the opponent I thought I had the chance to hit the side of his formation and maybe even find the opening to hunt down his High Priest. It is also important to note that we rolled classic scenario with Break Through secondary objectives. 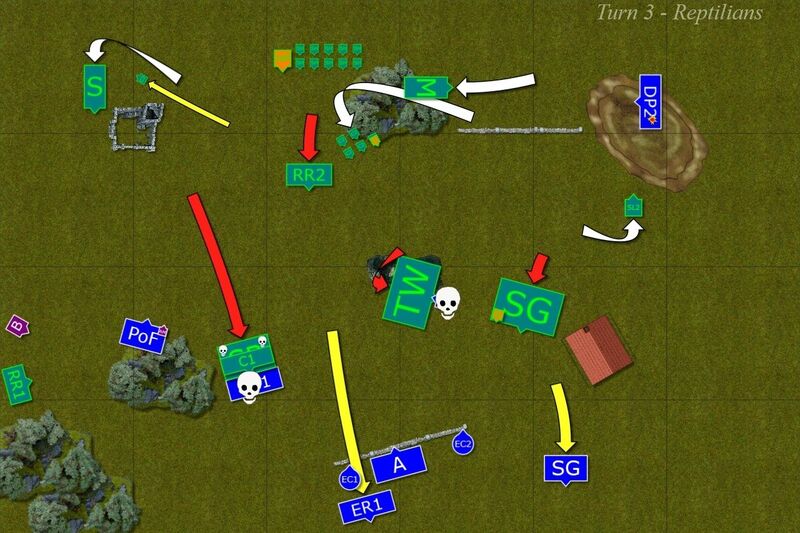 That is tough for me as well because I can do little to stop all of the scoring units entering my deployment zone so I decided to rather move some of mine there to balance out any losses. I also hoped that if I could put some pressure on High Priest I would be able to divert phalanxes of Suarus from marching towards my units and trying to save their general. Ruins - provide hard cover, dangerous terrain for all but skirmishers, cavalry, monstrous cavalry and chariots fail Dt on 1 and 2. With +3 to the first turn roll off I managed to secure it and the Outcasts moved first. In the meantime laribold rolled for a spell for his skink priest and got a Curse! 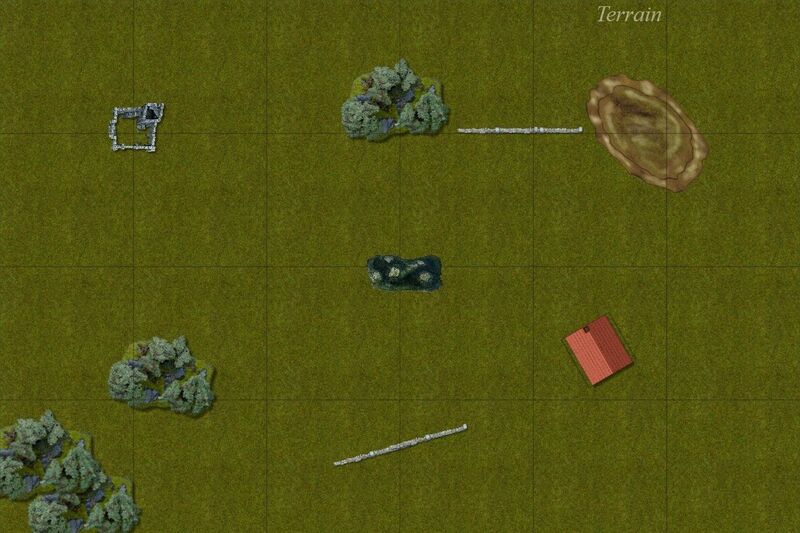 The Outcasts moved cautiously and tried to hurt the enemy army at range. Magic was not successful as Larry was kind of unfocused. Shooting, on the other hand claimed one spiky lizard despite it hiding in the jungle and panicked one remaining chameleon that felt way to insecure in the open. Reptilians moved strong in the center and covered their flanks nicely. Since some of their shooting assets were not available it was up to High Priest to use his magic. He used his vessels expertly and it looked like he was in a few places at the same time to cast some powerful magic missiles. Elves died but refused to acknowledge the warning. 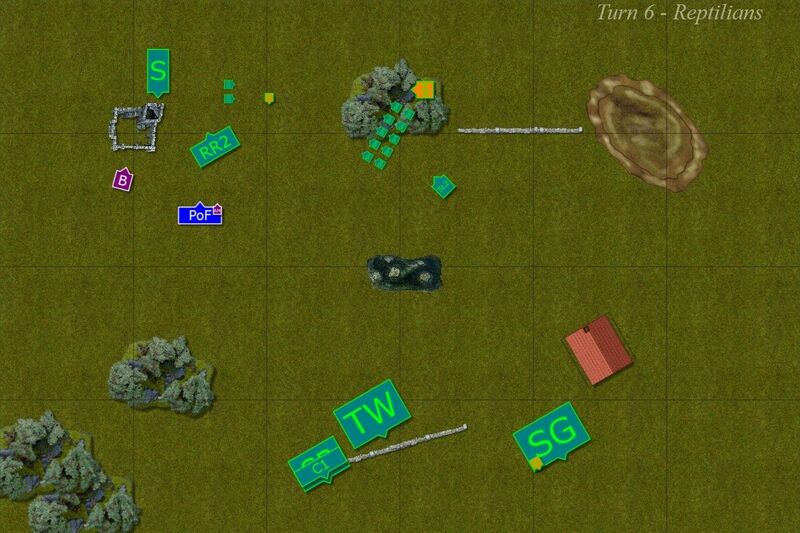 On the left flank the units moved to close with the enemy and tempt it to charge. Swordmasters were confident they can hurt even charging cavalry and allow for good counter charge. Valiant Reavers harassed enemy skinks and giant reptilians that accompanied them to allow the elven infantry to do their job. Then Larry cast his many spells and wounded nearby Spinosaurus really badly. Unfortunately, both eagle claws could not finish the job and a huge lizard limped away! The phalanx in the center kept rolling forward. The troops on the East withdrew but the Western flank attacked. First, skinks got rid of annoying fast cavalry and regrouped into deep formation. Then, the ground shook as heavy cavalry rolled forward towards Swordmasters. Warrior of Hoeth moved to position with confidence coming from centuries of training but ... their moves were unnaturally slow, slower even than their cold blooded adversaries who steamrolled the elves and used their momentum to move outside of the range of any counter attack. Shooting and magic proved to be disappointing too as wounded Spinosaurus was not finished either. Skinks and accompanying them Croxisauruses charge against the Knight who valiantly hold. The distance is not that close but nimble reptilians make it anyway. With the help of their High Priest magic they destroy the Knights and reform to look for new targets. In the middle Saurus move with a purpose and get closer and closer to Elven deployment zone. The remaining Knights charged against Maceosaurus and impale the beast with their lances. The attack was powerful and great Reptilian remained motionless on the ground. Protectors run towards High Priest, avoiding the attention of rampaging skinks and their big friends. Archers tried to get them from teh rear but the target proved to be too far away. Finally, reavers sacrificed themselves to postpone the inevitable. Raptor Riders come to the rescue by attacking protectors from the rear while their companions got ready to help. High Priest used his minions to block the Knights too. The situation is not yet safe but it is safer for sure. At the same time all three infantry regiments get very close to the Elven deployment and it was now clear they will break through with their next push. Elves were now fighting a losing battle and it was only a matter of how many will be able to survive. Protectors were supported by BSB to defeat Raptors and Larry cast a few spells but they didn't really change much. In fact, the shooters were already too nervous to even attempt to panic one of the enemy infantry. At long last Reptilians stormed through weak Elven centers and butchered any opposition. Even Sea Guard didn't escape as they were caught in overrun. To add insult to injury the Knights, that were outmaneuvered by nimble skinks, got destroyed by the spell they thought their armor if best defense. Reptilians won the day but the last word belonged to High Priest. He attempted to destroy Elven BSB but this time the armor was fire proof. Both Elven leaders and few of the protectors withdrew to contemplate the harsh lesson received from the followers of the Old Ones. First of all, congratulations to laribold for a well deserved victory! He did great with his army, was in control whole game and executed his plan with the efficiency and precision of the Old One! Well done! I would like to separate different areas of the post game analysis so that it can be used as feedback for 9th age teams. When I stepped back and tried to look at the game with the full benefit of a hindsight I concluded that I didn't use my assets well while laribold used his to great effect. In general, I think his army is better in close combat and has fantastic magical support while I had an advantage in speed and shooting. In particular, Reptilians are better at war of attrition but I lost a lot of my best combat units before they had a chance to fight. So I could not even think about getting into fights on my conditions. 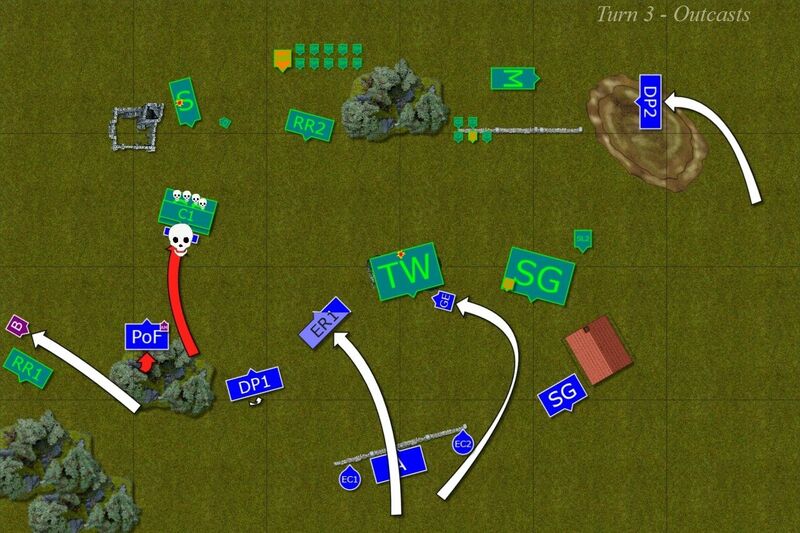 My initial plan was to win on my left flank and create a difficult situation for my opponent. If I succeeded I would be able to bring overwhelming force to hunt down his High Priest and his tough infantry blocks would have been threatened with flank charges too. The problem was I was nicely countered by fast units in laribold army so that my infantry could not approach easily and when it did it was destroyed by magic. Even the charge of Riders against Swordmasters was successful thanks to spells mainly. What I should have done differently was to deploy a little differently. First of all, position the central shooters further away to buy myself more time. His units would need to come to me anyway, in particular in breakthrough scenario. 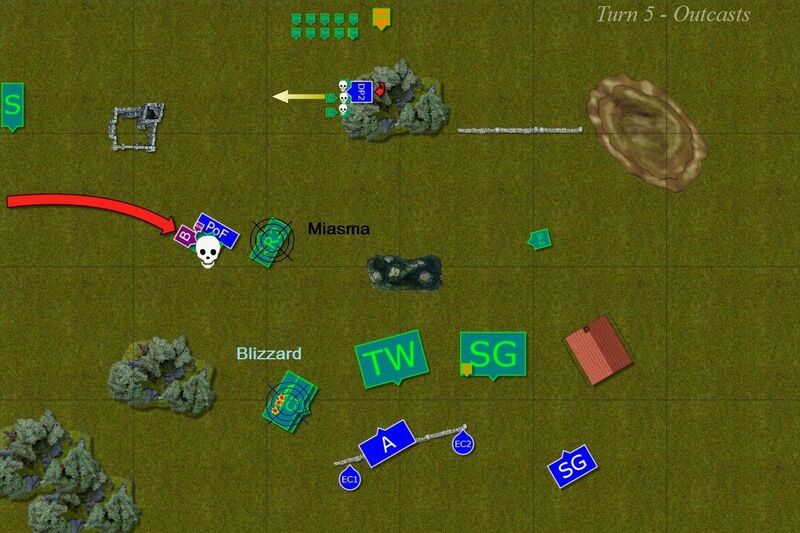 Sea Guard should have been deployed on the other flank and I should have formed task forces better. I have noticed that recently I kind of move my units individually rather than as teams. Refused flank was a good idea but I should have probably waited with my stronger flank, stayed away from the Slann and his magic 1-2 turns longer and use my shooting to hit the more vulnerable target - skinks with Croxisauruses. I totally neglected the fact they are quite vulnerable to shooting. I don't think it was a mistake to try and destroy Spinosaurus. It was dangerous because a combined charge of it and cavalry can destroy my infantry without magical support from the High Priest. 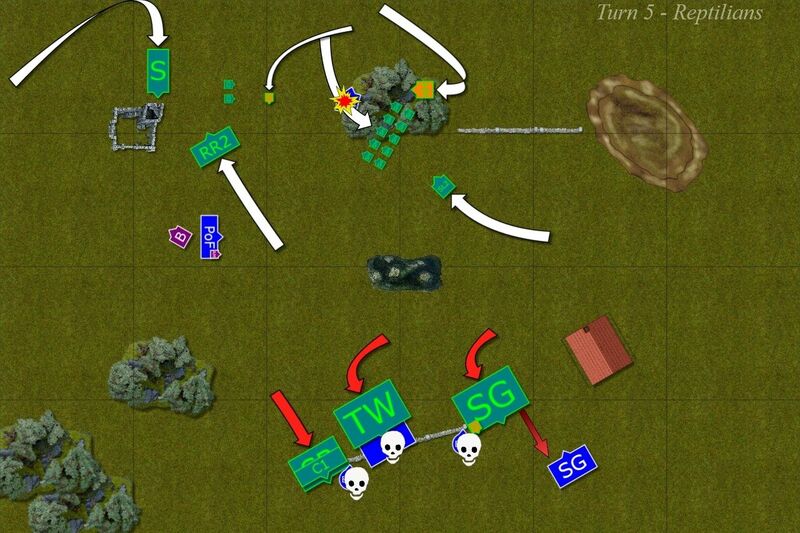 However, if I kept my flank away a little I could use my shooting to thin down skinks and make it possible for my units to win against them in close combat. Positioning of BSB was constantly horrible and I could not avoid mistakes here too. First, I had him fail to intercept Raptors that killed Swordmasters and then he was positioned badly when they could still reform to avoid his attention. That resulted in rear charge against Protectors and took away my chance to harm High Priest. I try to keep track of the changes that affect my games and I might repeat some of the previous observations but I guess it is because they do have an impact and I want to make sure that feedback is noticed. The games still take long. Again, I am not sure it is due to "new" system because we didn't have rules discussions. I do take into account the fact that it is a game online with chat so whatever could have been said in short time takes ages to type. I will see if it is ongoing problem but one of the things I believe would improve it is to have the rules explained in the right section of the rulebook. What I have in mind here is the description of Secondary Objectives. You write about the procedure of how you start the game which is very nice. But when you reach the moment where you select Secondary Objectives you have to go to Victory Conditions at the end of the rulebook to see what these objective really are. 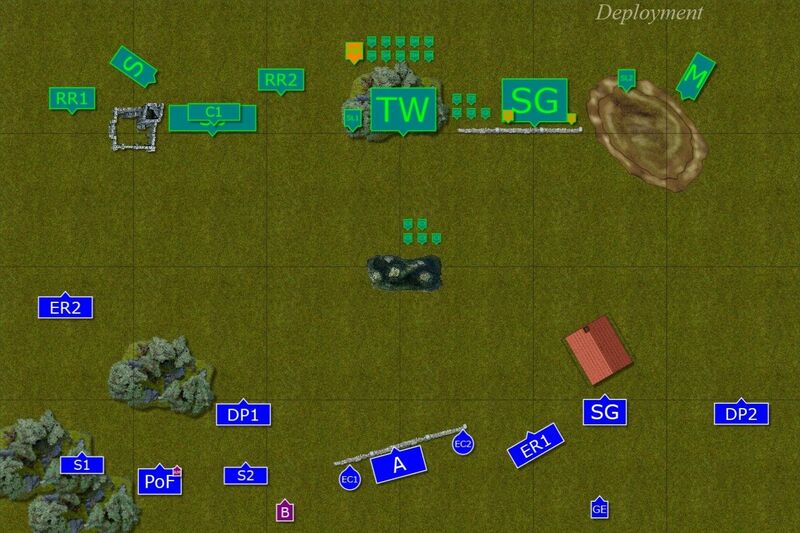 While it may be easy to remember these after some time and while it is handy to have them there at the end of the game, I would suggest to have the description when you explain deployment too. It is a detail that helps to avoid time wasting even if you repeat the same passage twice. The second thing is that I still "discover" there are changes that I was not aware of. Like the fact that "make way" disappeared. I was in the moment of the game that it would have been at not much consequence but it still felt like bad experience when Riders charged my Protectors and I could not make way with my general. Please, note, that I don't dispute that such rule change could be for better. Maybe. It might been be one of those rules that required attention to prevent silly situations. But it is definitely a situation where I feel like I made a mistake because my previous experience is now a liability, what I learned before puts me now at a disadvantage. And that is a very discouraging experience. Because I expected that 9th Age is going to be improvement to warhammer meaning, that whatever I learned by playing it for so many years would help me play better, not making wrong calls. In addition, I have made following observation. If I have to spend more time on the games because I might need to re-learn some things and my enjoyment of the battle is significantly decreased by the fact I make mistakes due to my experience so far (that should help me not be a liability) why should I keep trying? I have now a choice between 9th Age and other systems. I could spend the same time to learn something completely new where I might still make mistakes but I would know they stem from my lack of experience not because of having one! Basically, I want to ask, how do 9th Age team plan to convince potential players to try their system where there might be traps like I have just explained. Please, make no mistake here. I want 9th Age to succeed and I am very lucky to have amazing opponents in my games. I still had great time but it was thanks to them and less thanks to the experience of the game itself where I would like to focus on how to outsmart my opponent and not if I get the rules correct. I didn't have much time during writing the report so I decided to combine the list analysis with some post game impressions here. Let me go through their special rules and the way each unit performed in our game now. High Priest - magic was always a strong aspect for Reptilians and laribold didn't make an exception for his force. His High Priest knows all signature spells thanks to Universal Knowledge and that is a powerful combination indeed. Being level 4 makes it so because he can comfortably cast spells with 2 dice or safely make 3 dice rolls anyway. Since feedback from overwhelming power depends on how many power dice you use it is clear that T4 Priest is less worried about it than T3 elf. In addition, Priest is even more versatile because he can use other elements (not only skink priests) as vessels for their spells (not all of the spells though). Combine it with bound spells due to Sun Engine and it is easy to cast several magic missiles a turn even with low winds of magic while being in a relatively safe position too. You could witness the efficiency of the magic phase here where every single spell was cast comfortably and it was very difficult to make a decision which one to stop. BSB - very good choice, definitely helps Phalanxes a lot in his dual role as BSB and good fighter. Many units in Reptilian army have now the rule called "Born Predator" and they can re-roll 1's to hit too. It is a very good rule that replaced the one where for each 6 to hit a model could make additional attack. I10 is extremely helpful now and his already high strength can be further boosted. Priest - High Priest little helper is here to provide following assistance: improve the chance to get extra dice for channeling, act as a vessel and carry always useful Dispel Scroll. Beast magic suits Reptilians very well too. Small investment but great addition for sure. Saurus Totem Warriors - I always imagined that Reptilians army are not true armies without phalanxes of these brutal warriors. With new rule to allow them re-rolls to hit if 1's are obtained and then new parry rule means they can take come charges and hit back too. They are very good ad grinding and war of attrition and can absorb some shooting damage well. Excellent core regiment. Skink Hunters - skirmishing regiment that often acts as bodyguards for high Priest so that the infantry can get close and personal with the enemy. Very useful thanks to its maneuverability. Saurus Shrine Guard - Elite saurus warriors. They hit harder although may choose more defensive option with and weapon and shield if need be. There is also an option for High Priest to join them so that there is also a choice to consider and not reveal the plans to the enemy. In fact, it is also very handy as the Priest can easily move to join them during the game (e.g. using Shadows magic lore attribute :)). Chameleons - very annoying scouts, harder to spot and not so easy to get rid of but very helpful to the whole army indeed. No surprise to have them here at all. Saurus Raptor Riders - hard hitting cavalry, even in small units they can hit hard and then keep grinding the enemy down. Potentially 1+ armor save but quite expensive if given that opportunity. 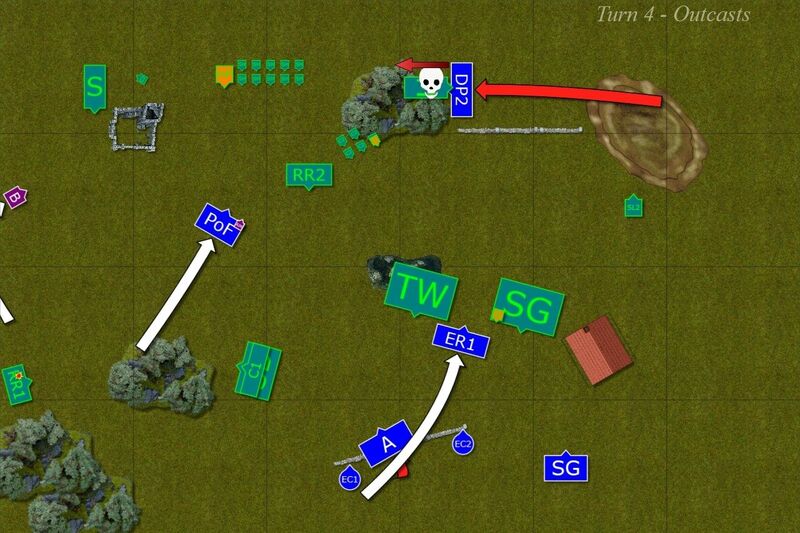 Very good with Lances as riders have 2 S6 attacks on the charge. They also reroll 1's to hit so there is some insurance for rubber lance syndrome. Fast as heavy cavalry goes and big threat to my small units as it was seen in the game where their mere presence on the flank stalled the advance. Did they need the improvement in the form of Lance replacing Spear? I don't think so. They are hitting hard enough on their own and in the same way as I oppose improvement of elven knights to get S4, I don't think Riders need lances either. Maceosaurus - For me this beast is some kind of heavy but slow chariot for Reptilians and is great as a support for infantry. It has the bound spell to cast some always handy magic missiles but Sun Engine also adds +1 WS to the troops in 6" which is really neat help. It was used very well to slow down the advance of the Knights along the flank and I think I should have pressed much harder to hunt it down earlier. This is a is Volley Gun Artillery Weapon with the following profile: Range 18”, Strength 4, Quick to Fire, Multiple shots (2D6). The Spike Lizard can move and fire, but not march and fire. If a misfire is rolled, it suffers a single wound with no saves allowed. No problems with handlers anymore as it is just a single model with a single profile now but it is still considered as a skirmisher. It is very helpful to get rid of cheap diverters but can also be dangerous for other units or simply finish off the wounded ones. It was a priority for me as such shooters can quickly decimate my small units and make them unusable in combat. Spinosaurus - it is another great support for Reptilians. It has bound spell and adds +1 to WS due to Sun Engine but also can be a magic beacon as skink priest. 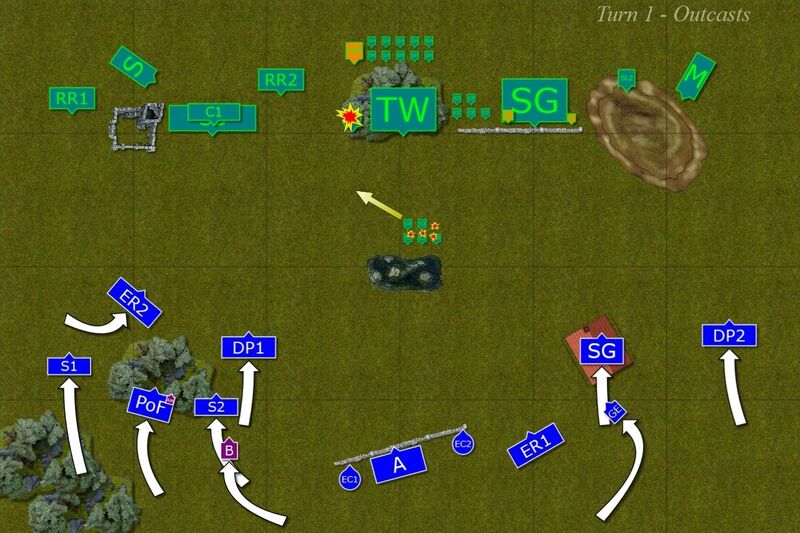 So my opponent had both flanks covered thanks to these models. Then it is fast monster that does not have many attacks but still thunder stomps infantry. On top of that it has a S5 d3 wounds shooting attack that may be problematic for the griffon rider too. All in all I think this particular army is awesome. It has plenty of tools, looks like an army, participates in all phases of the game, can be both offensive and defensive force. In the same way as with Reptilians I wanted to add something about the units in my army list and how I think they performed in the context of 9th Age. Master of the Paths - I think I have mentioned it before but I found new Miscast Table harsher for low toughness, low wound casters than for the level 4 wizards, in particular if they have higher toughness and/or good protection. Yes, if you risk 5 dice spell you can lose your expensive model immediately. It may prevent that silly powerful spells to be cast every single turn without a chance to be dispelled. However, even 3-dice miscast will easily hurt T3 models and be nothing of a problem to tougher ones. At the same time, the approach where once per game you risk that one boosted spell to give you a small edge over more powerful opponent wizard is kind of taken away. I will less likely even attempt to cast a spell with 5 dice to get double 6's because it is still not a guarantee I can succeed (the opponent might still have more dice and/or bigger bonus to dispel it or simply use dispel scroll) and the consequences can still be severe. I need to have a look at the option of 4-dice casting again but my initial impression is that while people might have stopped casting one big spell, their magic phase is as difficult to counter as before while in order for mine to work I simply need to roll doubles for winds of magic. I don't need 5-dicing a spell to get them through. But I think I lost that option and that the consequences are harsher for level 2 wizards than for level 4 ones because they have fewer situations where they need to risk such situation. Griffon Battle Standard Bearer - still very expensive model for much less options to be used for. I know EoL army book team wants to make it less expensive but I am not sure if the simple point reduction is going to be enough. At the moment Griffon looks like bigger eagle only. And I still keep wondering if taking foot BSB and separate eagle rider would not be more beneficial. Griffion at the moment does not bring much more to table than Eagle. It is of course good thing to have 1 more wound and 1 more toughness but Eagle can be armored better, is faster and way cheaper. Coastal Guard - I like the heavy armor option as well as KB for spears against certain foes but they are still support troops for me. Very important, no mistake about it but the battle showed clearly they cannot stand alone against dedicated combat infantry. Especially that their Supernatural Reflexes rule is often countered by Parry. Archers - I still used them as a secondary source of ranks but I may need to reconsider that. First of all the volley fire is helpful but only if you are stationary so I need to be careful how I move them to let all the models to shoot. Because of that the advantage in range is a little bit mitigated. But it is good to have the ability to hurt the enemy at longer range. Knights of the Dragon Realm - many EoL players are happy with them having S4. I am still not convinced it is needed. It does help of course and while I have it such improvement helps a lot. However, I haven't read a single explanation that would convince me they needed such change in the first place or that they were the unit that needed any attention at all. I believe each army should have different set of skills to promote different type of play style. Elves don't need the units that hit as hard as Chaos Knights (or even better) because brute strength is not what they focus on. I think the main problem was that there are things such as monstrous cavalry, that hit much harder and are more durable that typical heavy cavalry lost its role as line breaker. I think they were perfectly fine without any changes at all. They are still dangerous against other heavy cavalry but they should not, in my opinion, aspire to be as hard hitting as monstrous cavalry. In any case I think EoL army had more serious problems than the Knights. As I said, I don't think they needed any change. With M9, I6 and 2 Attacks each they had their unique flavor while still good at hunting other hard hitting elements such as monsters, chariots or their counterparts in the enemy armies. Swordmasters - Swordmasters got better and I think that also made them more vulnerable because people focus their attention of warriors of Hoeth a lot. Before it was possible to make them wonder what is the target priority. Now, they really want to hurt Swordmasters first even if they are not the first threat at particular moment. It means I need to try and find a new way to let them get into combat. Protectors - I am not much impressed by these guys yet. it might be my own problem of not being able to make ward saves but they don't seem to be more resilient than other infantry to me. They don't hit hard either so I keep wondering if I want to keep them. At the same time it is possible that the opponents, knowing they are better protected, in particular against magic, didn't bother attacking them but chose Swordmasters. The choice looks simple when Swordmasters are far more dangerous in combat but are easier to kill. Coastal Guard Reaper - little bit more expensive but still good as always. Great Eagle – same as above although a little slower. In general, I think the army I use works in a similar fashion. The main field for improvement is getting right equipment for Griffon and to try and find unique role for him instead of investing same points in a far more versatile BSB + eagle rider. Thanks for the feedback provided Swordmaster. Quote : "Knights of the Dragon Realm - many EoL players are happy with them having S4. I am still not convinced it is needed. It does help of course and while I have it such improvement helps a lot. However, I haven't read a single explanation that would convince me they needed such change in the first place or that they were the unit that needed any attention at all." All Elve's elite cavalry (and not only elves) have S4, why not us ? They absolutly need it if they want to compete with others special choices and against Elvish Heavy Cav. It also give us an appreciable hard and fast hitting unit. Give them back S3 and i'm not sure to see them anymore on the table : they cost too much for a bunker, it's a special choice, they don't strike enought to field them when you can get lions guards or swordmasters (with more bodies and more damages). Well, I don't think the fact that other armies might have something is good reason to demand something similar for Highborn Elves. Sylvans as well might start asking for lances for their cavalry and S4 infantry since other Elves have it. And it does not create variety as units are the same but with different names. I still was not shown good example/reason that the fact many people didn't take them in 8th edition was because they were too weak. I had more than 100 games where they did what I asked them to do. Something not core heavy cavalry nor elite infantry could do. They are not supposed to be a bunker and have significant advantages over lions or swordmasters. I would really prefer to play games with them as they were and see how new core rules and changes in other books affect them. My opinion is that the Knights didn't need changes. There were other choices that required attention. By making them S4 you create auto-include unit and now you will see the Knights in every army. That is not what balanced army book should aspire for, there are so many other choices in it that there should be no 2 armies alike. All this escalation is due to EoD. For 26pts they have prety good knights that can't flee for sure but strike very well and with T4. The fact that we have KotDR with 2A and S4 is only due to this : compensate the fact that EoD are better than EoL in all section (Sylvanian fast cav still better than our old DPs too). There is of course a subject to talk about this on the forum but i still think that KotDR with 2A and S4 is a good balance between the cheap (but strong) EoD knights, the fast sylvanian's torpedo riders and the mighty saurus raptor (slower but stronger). Mostly for a price arround 32 and 35 points per model. I don't think that the dragon armour rule is a huge value because it only realy help you against metalshifting spells (having flaming attack is just an option after all). All the armies are able to field something to counter this fireborn rule. - they are better than phoenixes for the same job but not the same price. - the torpedo : Hcav, KotDR, Phoenix. And the torpedo needs S6 (to still usefull against those T4) or a low price. I am quite happy to discuss the Knights here, also because in the dedicated topic the discussion was kind of derailed (and I was partially to blame :P). I am always careful with direct comparisons between the armies because the same unit is worth differently for each force. For example, a unit of knights for otherwise slow and infantry based army is a great addition. The same regiment for fast, mounted force may still be useful but is one of the many similar options and will definitely play different role. Even if in both cases the knights are there to charge as only then they can use their lances to full effect. At the same time, while I personally like EoD Knights a lot they are not very popular either. That might suggest that the knights themselves were not really a problem but maybe people in general find it more difficult to use or simply have better choices? But what I liked about direct comparison between three elite cavalry units among the Elves is that they were unique and emphasized the way each army was portrayed. EoD are vicious and that was well shown with the fact their mounts contribute to the fight while the riders hit hard thanks to their army wide rule. Sulvans have their own glass cannon, the unit that hits way too hard for the cost but at least it was not that well armored. And Dragon Knights have their uniqueness because they have the finest armor of them all, are not furious or stupid so they can be controlled far better and with 2A each they hit often enough to avoid rubber lance syndrome. 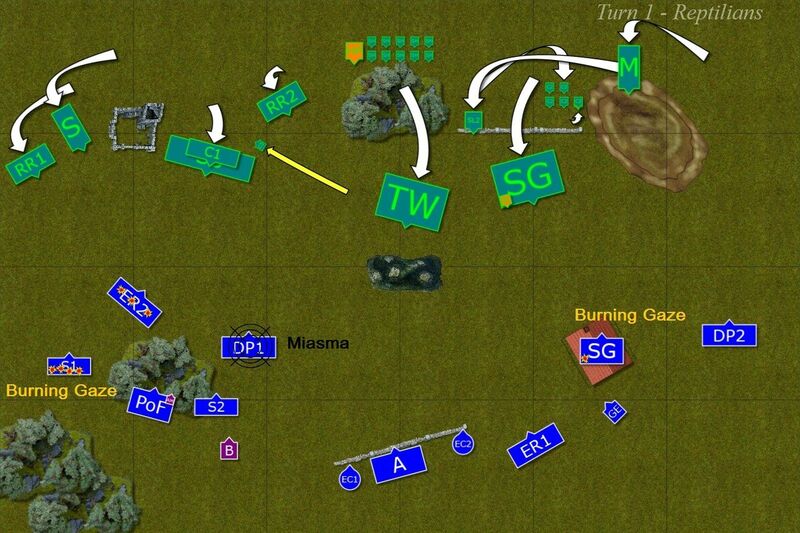 My concern is that people are too eager to keep improving units across the armies. That requires more work because they need to test these ideas and make the cost right and at the same time would create an arms race. Where the priority was to balance the system that is already very complex. I keep fingers crossed for all the teams to do the great work and I am already impressed by what they have done as it requires a lot of effort. Just think about the fact that many of these people are on different continents and need to co-ordinate their work. Thanks for the game Swordie. It was a pleasure to finally get to play against you! From my perspective, I had something of an advantage thanks to my Chameleon Skink spies, (or at the very least having read all your battle reports over the years). It meant that even with the change to 9th, I had a good idea about your armies strengths and weaknesses, whereas you were going into the battle 'blind' as it were. Having faced elite Elven infantry already in 9th, I was pretty clear that I needed to try and cripple or destroy these hard hitters first up. In your case it meant going for the Swordmasters. With all my damage spells being flaming, it meant that I knew I couldn't really damage the Knights of the Dragon Realm (well not until that exceptionally lucky/unlucky Searing Doom at the end!) and your Protectors were well and truly Protected from my ranged magic by their Ward Save + Magic Resistance. It did leave your dangerous Swordmaster units as the only real target for my damage spells, of which I had a lot (3x Burning Gaze, Fireball and Searing Doom!). It's part of the problem of putting Larry into the Protectors that you pointed out. It can almost look to an opponent like a mini-deathstar in terms of it not being worth attacking through magic. Hence I didn't really have any difficult decisions to make when it came to target choice. Larry might be better off, unit hopping a bit more to spread his MR around, especially in the early turns? I was also most worried about your Dragon Knights, as they could really hit hard and it would have been interesting to see who would have cracked first had you tried to stay back for longer and play a more ranged shooting opening to the game. Certainly my Scrox would have suffered more! I'm pretty pleased with how I played (as I'm sure you can imagine!) but got pretty lucky on a few occasions. 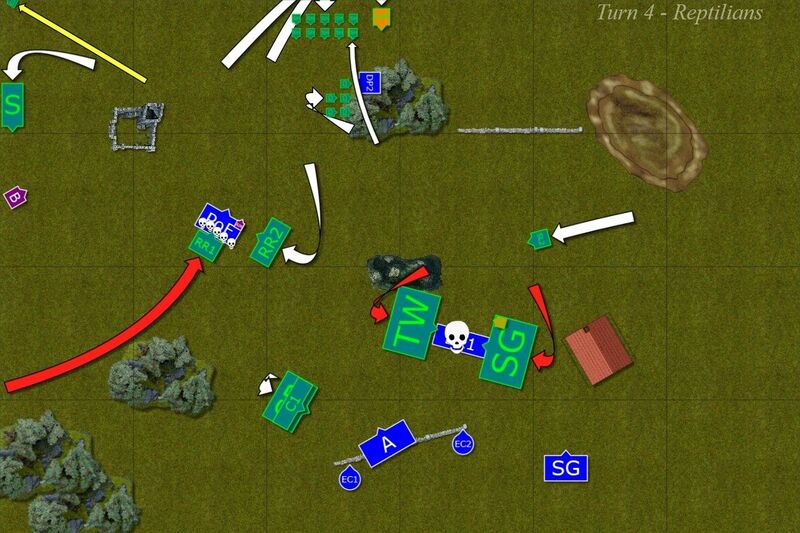 The trap you set up with the Swordmasters and BSB on the left flank gave me no real choice but to charge in with my Raptors and it was magic and a decent overrun (9 on 3d6 iirc) that allowed me to survive that. The mistake that nearly caused it all to fall apart near the end though was not charging your eastern flanking Dragon Knights with my Maceosaur on Turn 3. I was going to, but just forgot. Simple as that. By charging, I would potentially take the lances out of the equation leaving you S4 vs my T5 2+ AS. I could hopefully have just ground you out and kept you pinned for much of the game. By letting you get the charge I allowed the Dragon Knights dangerously close to my backfield and my precious Mage Priest. But he can clearly look after himself with his blasty magic! My impressions of 9th are similar to yours and SmithF's it's still very much a work in progress. I'm looking at it very much as a New Edition and all that that would entail, rather than just a fix/patch/tweak to 8th edition. So, I'm still needing to look up rules to check I've got them right but so far I like pretty much most of what's been done so far. Thanks a lot for your feedback! It is always great to have it from the point of view of my opponent, in particular when he won! It is a very good point about Protectors. I automatically assumed that they will be chosen bodyguards for my general but didn't think that they might look like much tougher nut to crack. Even if they are not as resilient as it may seem, it is always easier to target Swordmasters because they are far more vulnerable. Indeed, I should have at least considered moving my general to one of these regiments so that I could have a chance to mitigate the incoming fire. At the same time, if I were to leave Protectors what role would they play? They are not great in terms of offensive power. On the other hand S4 vs T2 of skinks is actually the same as S5 anyway. I was really surprised that you didn't charge with Maceosaur but at the same time I was lucky to get double 6's for charge roll because otherwise it was a long one too. In the end, even if it made your High Priest a little nervous, you had him in a safe spot. As to Riders getting to overrun far enough to avoid counter charge it is still my mistake of not checking the possible distance for them to do so. Just a small shift would allow BSB to cover that possibility easily. Instead, I had to deal with them later and they slowed down my advance. Enough to prevent the Protectors from reaching your deployment zone at least. I think you didn't make a single mistake that would have cost you a game anyway. At the same time, some so called unlucky rolls on my part would not really change the outcome I think. Maybe with the exception of charge of Protectors because I was really looking forward to that bloody fight. It was a risky charge but I was willing to take one. Thanks again and hopefully we will have a re-match soon! I do not meant your roster was a wrong build up or anything. I concluded that because your assessment (there is not a single game in which I could not have done better) is true for all of us. Logic leads me to think that you opponent should have done as well some sort of mistake (he can't play 100% perfect for he is not a machine), so the logic conclusion of my reasoning is that a EoL cannot make any mistakes because they are punished much harder than to many other armies. That was my logic reasoning but maybe I read too fast you battle report. Your assumption is correct! It is hard to have a game with no mistakes at all. In this particular game my opponent played better, however. If he made mistakes I didn't exploit them. In any case, whenever I analyze the game I played, I start with myself. Even if I win and I don't think I made any glaring mistakes I still try to look for other options. They don't need to be better. It is just the nature of the game that there are many paths to victory. If I lose it is always clear where I made mistakes. If I didn't make them the result would be better. Not a guarantee it would be a victory. But because I made them and my opponent noticed them so he could exploit them, that is why the defeat was a certainty. So, while I see how you reached the conclusion, I think it is not so straightforward as there are many factors that contribute to the end result. And while both sides can make mistakes, they are not equal and they don't have the same consequences. Hi Sword Master. I'm quite impressed that you seem to be having quite some problems to reach victory with your usual system. I have the impression (from the battle reports you have posted) that your defeats are not due so much to strategic problems of yourself but rather because the army is clearly lacking "something". Any thoughts on what this "something" might be? For me it is quite clear Protectors of the Flame are not the rock they say they are, Swords experience real trouble to make it to combat (at least in the way you build your roster) and of course our core CC units are not able to resist at all a serious combat, and of course they will bring almost no damage. From my point of view (you know we have discussed much about this) this shows a serious point of army design (this is my personal point of view). Out of curiosity, I'd have a last request: why you still try 7.0 army and have not given a chance to the pre-beta army? Is there any particular reason? I have never played a single game where there was not a thing I could do better. There is always plenty of room for improvement. Even if I play against much better player I should not make situation easier for him by making mistakes. This game is not an exception. I made a wrong assessment of the situation that led to wrong decision (i.e. 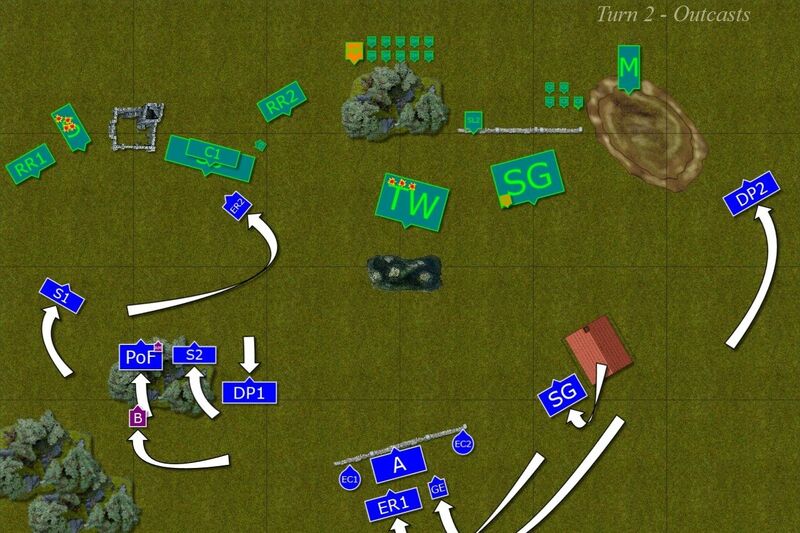 moving on the left flank too early and deploying the center too much forward) and laribold, my opponent, exploited my mistakes and played to his strengths. I am thus surprised you concluded that the army list or even the way the units are designed are at fault when it is clear it was me who made mistakes and didn't play to the strength of the army. It is absolutely not true. The army lacks nothing at all. The reason for version 7.0 is very simple. We played that game when that version was valid. It takes a lot of time to prepare the report and in addition I was away for a week and could not update it. The rules change very fast in comparison. Great write-up and plenty of food for thought. I'll be bringing some of your points up to the EoL and other committees. Thanks Axiem! I am glad to know the report with now obsolete version of the rules can still be useful! I took the liberty of re-posting the conclusions to relevant topics in respective sub forums for your convenience too. Thanks for the report, Swordie! Like we've discussed before, 9th age is a different animal altogether and we need to "unlearn" certain tactics and lines of thought that would have been very effective in past editions of Warhammer. I agree with most of the conclusions you've come to in your reports, although as far as game time is concerned, I have noticed that it is because I need to go back each time and check profiles/rules/spells. Each version changes certain things, which means that you don't have the same laid back feel you had when facing armies in 8th. This makes me more cautious, double-checking a unit's abilities before charging and so on. In the end, the game lasts for 4 hours when it should have been over in two! But I think that these details will be ironed out, and we'll get used to the rules changes. Parry is the biggest change in my opinion, it makes front charges against ranked infantry a dangerous decision! So that means that you'll have to try harder and get these flank charges off! Keep at it, and thanks for the report! I really don't mind learning new things and trying new options at all! I think one of the reasons I feel this way is that I have never had a chance to participate in playtesting process and it might stem from that rather than from "new edition" syndrome. I am sure things will be ironed out and I hope I will have enough time to keep playing and posting more reports. Speaking of which, when can we expect some of yours? If you mean how NOT to play with EoL against Reptilians then I fully agree Or, if you are aspiring High Priest then it was definitely a great example of how to use such beautiful army to its great potential.